2 of 3 Separate each package of bread-stick dough into 12 strips. Lightly roll 2 strips to 1-1/2-inch width. Spread middle of 1 strip with scant 1/4 teaspoon pesto. Place string cheese half on top of pesto. Spread scant 1/4 teaspoon pesto over middle of second strip of dough. Moisten edges with water. Place, pesto-side down, on top of cheese-topped strip; press edges together to seal. Repeat with remaining dough, pesto and cheese. Transfer cheese-bread sticks to ungreased baking sheet. Lightly brush with beaten egg white; sprinkle with grated Parmesan. With sharp knife, slash three 1/2-inch-long vents in top of each stick. 3 of 3 Bake in 375 degree F oven for 12 to 15 minutes or until golden and puffed. Heat spaghetti sauce in small saucepan. 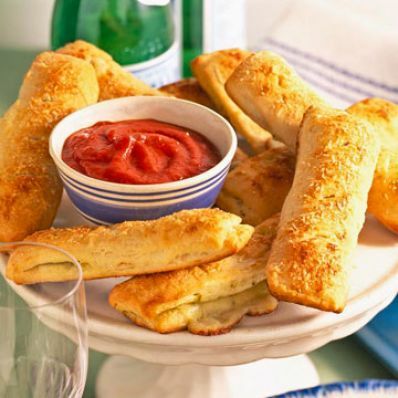 Let cheese sticks cool slightly. Serve with warmed spaghetti sauce for dipping. Makes 12 sticks. Per Serving: 2 g sat. fat, 26 g carb., 8 g pro., 9 mg chol., 6 g Fat, total, 494 mg sodium, 1 g fiber, 197 kcal cal.